Select Join A Meeting > Join. Enter the Meeting ID number and input your name. Also select if you would like to connect audio and/or video and select Join. Enter your meeting ID provided by the host/organizer. 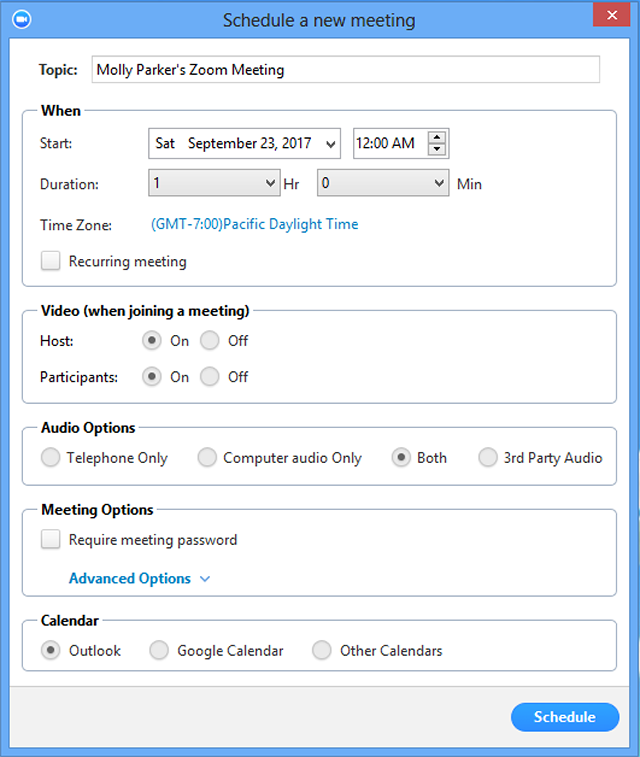 If you are online, with the Zoom desktop client or mobile app, others will have the ability to send you a meeting request via instant message. You will receive an incoming message notification displaying who is calling along with a ringtone. Select Accept to join the meeting with the person who is calling you. On your phone, dial the teleconferencing number provided in your invite. 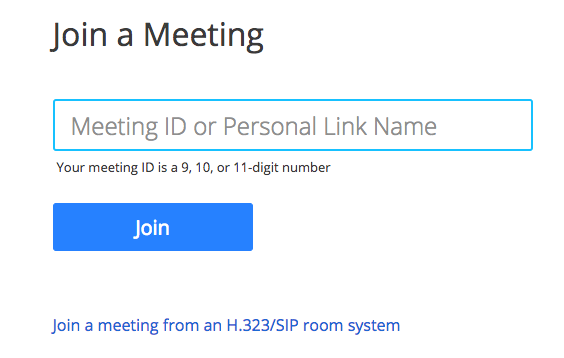 Note: If you have already joined the meeting via computer, you will have the option to enter your 2-digit participant ID to be associated with your computer. If you have not joined on your computer, simply press # again when prompted to enter in your participant ID. Dial the IP address provided to you in the meeting invitation (requires Room Connector port add-on). Enter the meeting ID via touch (DTMF) tones followed by "#". Or you can use dial strings, such as 192.168.10.55##000111000 to join directly in to the meeting. Please see Getting Started With Cloud Room Connector for more information. Open your Zoom client and sign into Zoom. Select your meeting settings. Note that some of these options might not be available if they were disabled and locked to the Off position at the Account or Group level. Start: Select a date and time for your meeting. You can start your meeting at any time before the scheduled time. Time Zone: By default, zoom will use your computer's time zone. Click on the drop down to select a different time zone. Recurring meeting: Choose if you would like a recurring meeting, i.e. the meeting ID will remain the same for each session. Audio Options: choose whether to allow users to call in via Telephone Only , VOIP Only (computer audio), both, or 3rd Party Audio (if enabled for your account). Advanced Options: Click on the arrow to view additional meeting options. Enable join before host: Allow participants to join the meeting without you or before you join. The meeting will end after 40-minutes for Basic (free) users if 3 or more people join the meeting. 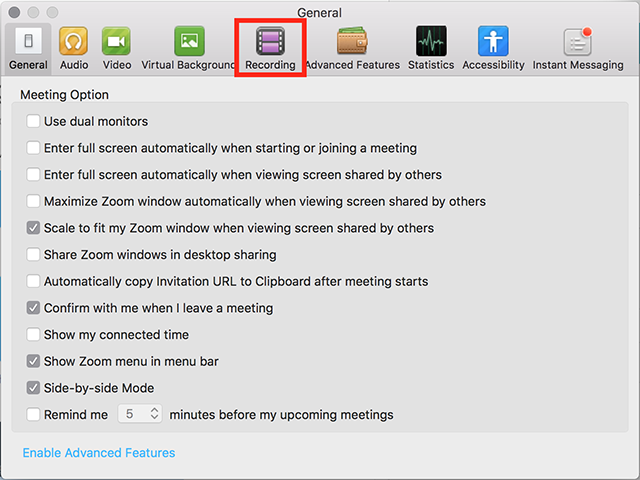 Record the meeting automatically: Check this if you want the meeting to be automatically recorded. Select if you want it to be recorded locally (to your computer) or to the cloud (zoom.us/recording). Schedule For: If you have scheduling privilege for another user, you will be able to choose who you want to schedule for from the drop down. Calendar: Add to any selected calendar and send out invites to participants. Note: Choosing Other Calendars will allow you to copy and paste the scheduled meeting information such as date, time, and meeting URL into an email that you may send to invitees. After you are done setting up your Scheduled meeting, Click the Schedule icon at the lower right-hand side of the window. 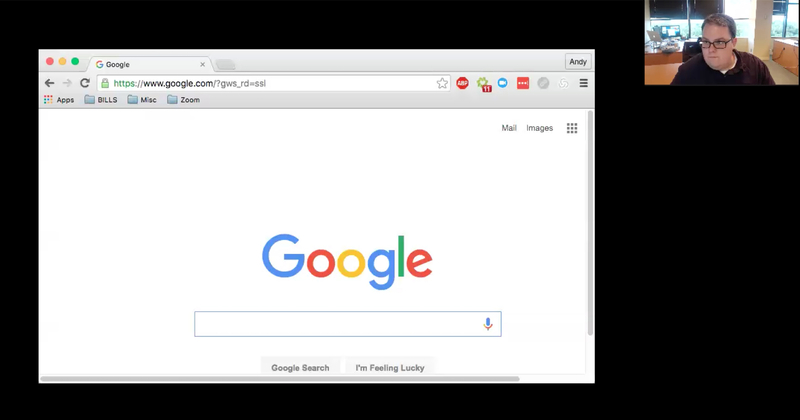 Click on Repeat to open up recurrence options in Google. Start: Select a date and time for your meeting. Click Schedule to finish, and open up which ever calendar you have selected. Note: Choosing Other Calendars will allow you to copy and paste the scheduled meeting details into an email that you may send to invitees. Select the meeting options. Note that some of these options might not be available if they were disabled and locked to the Off position at the Account or Group level. List this Meeting in Public Event List: If your account has the Public Event List enabled, check this option to include this meeting in the list. Attendees register once and can attend any of the occurrences: Registrants can attend all of the occurrences. All dates and times of the meeting will be listed and the registrant will be registered for all occurrences. Default to HD Video: If you enable this option, the participant view will always default to HD video automatically (if the feature is available via the Account Settings). Advanced Options: Click the arrow to view additional meeting options. 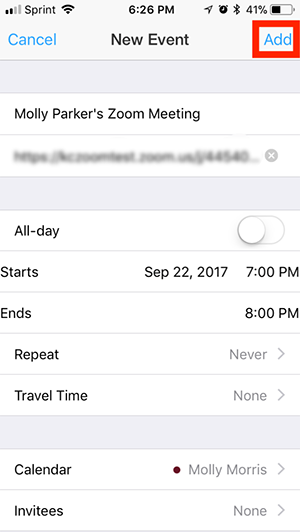 Once finished, you can either select a calendar option to add the scheduled meeting to your calendar or select Copy The Invitation to send out the invitation to your Zoom meeting. Copy the Invitation will open up a window where you can copy the full invitation to send out via email. Sign into your Zoom application, then select the Schedule icon. Select the options for you meeting. Note that some of these options might not be available if they were disabled and locked to the Off position at the Account or Group level. Only signed-in users from specified domains can join: Check this option if you want users to be required to be signed into their Zoom account under a specified domain. Click Schedule to finish, and open the calendar you have selected. When: Select a date, and time of your meeting. Timezone: By default, zoom will use your device's time zone setting. To change the time zone, click this field. Repeat Choose if you would like a recurring meeting, i.e. the same meeting ID for all occurrences. Audio Options: choose whether to allow users to call in via Telephone Only , VOIP Only (computer audio), or both. Password: You can select and input your password here. Joining participants will be required to input this before joining your scheduled meeting. Enable join before host: Allow participants to join your meeting before you. The meeting will end after 40-minutes for Basic (free) users if 3 or more people join the meeting. You will then be prompted to invite attendees. 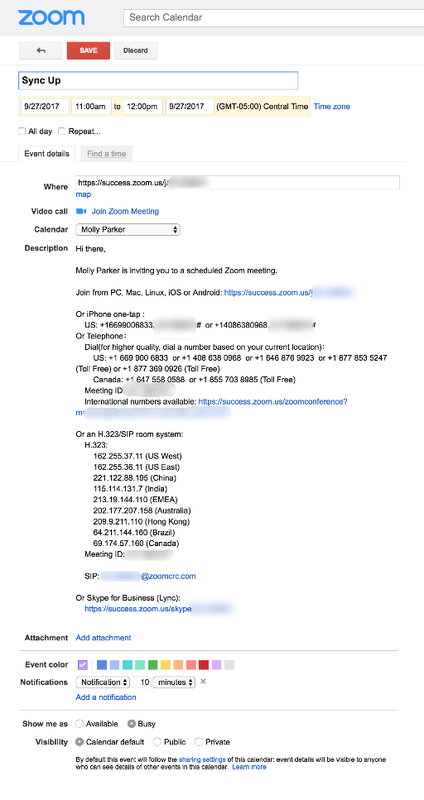 Topic: By default, this will show your name's Zoom meeting. Enter a topic/name for your meeting. Starts: Select the date and time of your meeting. Duration: Choose the approximate length of your meeting. This is for scheduling purposes only. The meeting will not end after this length of time has passed. Timezone: By default, zoom will use your device's time zone setting. Tap on this field. Repeat: Choose if you would like a recurring meeting, i.e. the meeting ID will remain the same for each session. Use personal meeting ID: Choose this if you want to use your Personal Meeting ID. If you do not choose this option, a random, unique Meeting ID will be generated. 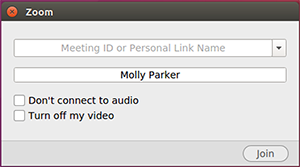 Host Video On when starting: Toggle this to choose if you want the host video on by default when joining the meeting. Attendee Video On when joining: Toggle this to choose if you want the attendee video on by default when joining the meeting. Meeting Password (Optional): You can select and input your password here. Participants will be required to input this before joining your scheduled meeting. Advanced Options: Click here to view additional meeting options. 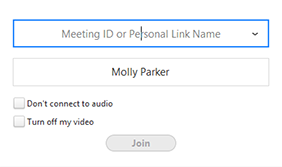 Allow join before host: Allow participants to join your meeting before you join the meeting. The meeting will end after 40-minutes for Basic (free) users if 3 or more people join the meeting. 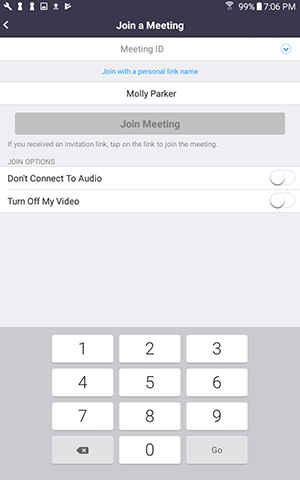 Record the meeting automatically: Choose if you want to record the meeting automatically. Schedule for: If you have scheduling privilege for another Zoom user, you will have the scheduling privilege option and can choose who you want to schedule for. Alternative Hosts: Enter in the email address of any other Pro users on your account who you want to be able to start the meeting in your absence. Read more about Alternative Hosts. You are prompted to add the meeting to your iOS calendar, where you can invite attendees. A non-recurring meeting ID will expire 30 days after the meeting is scheduled for. You can restart the same meeting ID as many times as you would like, within the 30 day period. A recurring meeting ID will expire 365 days after the meeting is started on the last occurrence. 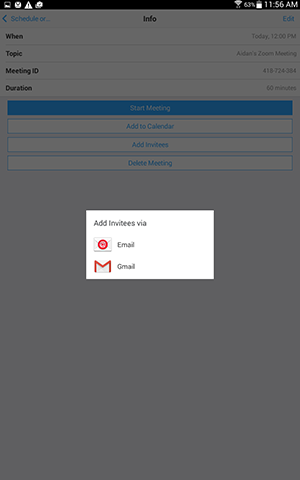 You can re-use the meeting ID for future occurrences. Scheduled meetings can be started at any time before the scheduled time. 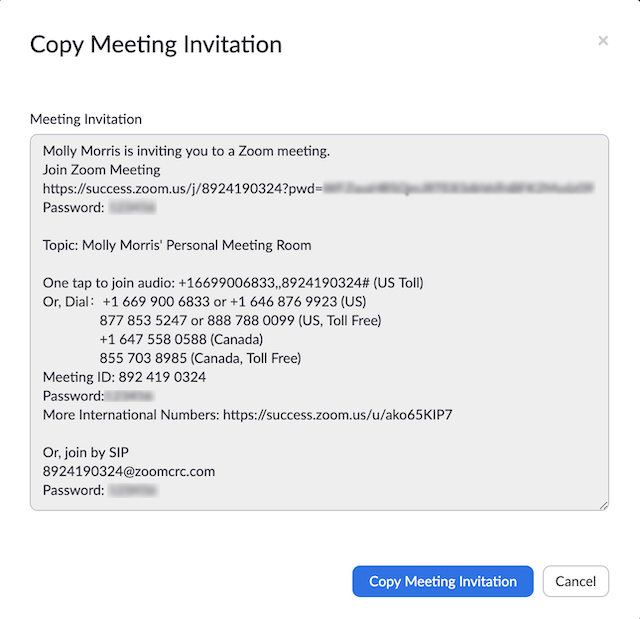 The links will not expire or become invalid unless it is past the 30 day period for a non-recurring meeting, has not been used for over 365 days for a recurring meeting, or has been deleted from your Zoom account. An instant meeting link will expire as soon as the meeting is over. Host controls allow you as the host to control various aspects of the Zoom Meeting, such as managing the participants. The host controls will appear at the bottom of your screen if you are not currently screen sharing. Invite: Invite others to join your meeting. Read more about inviting participants. Manage Participants: This opens up the Participants window. Read more about managing participants. Polling: This allows you to create, edit, and launch your polls. The options to create or launch polls will open up the Zoom web portal in your default browser. Read more about meeting polling. 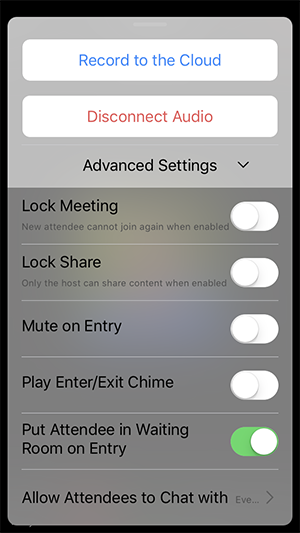 Screen Share Controls (via the ^ next to Share Screen): Select who can share in your meeting and if you want only the host or any participant to be able to start a new share when someone is sharing. Chat: Access the chat window to chat with the participants. Read more about in-meeting chat. Record: Start or stop a cloud or local recording. Read more about local recording. Read more about cloud recording. Closed Caption: If you have enabled closed captioning for your account, click here to access the closed caption options. Read more about closed caption. Breakout Rooms: Start breakout rooms. Read more about breakout rooms. Live on Workplace by Facebook: Click this to take your meeting live on Workplace. Read more about going live on Workplace by Facebook. End Meeting: This will end the meeting for all participants. If you want to have the meeting continue, you should give another participant host control before leaving the meeting. When you are screen sharing, the controls will appear in a moveable bar. It is typically at the top of your screen, but you can drag it around as needed. More: In addition to the Invite, Recording, and Live Streaming options, the options for Chat, Closed Caption, video and audio settings and ending the meeting move under More. There are also new settings specific to screen sharing. MacBook Pro models with Touch Bar can also use the Touch Bar meeting controls. Learn more. Polls: This allows you to create, edit, and launch your polls. The options to create or launch polls will open up the Zoom web portal in your default browser. Read more about meeting polling. 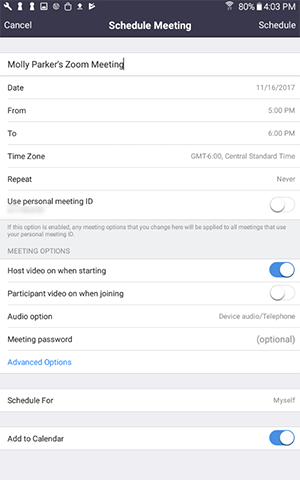 More: In addition to the Invite and Recording options , the options for Chat, Closed Caption, video and audio settings and ending the meeting move under More. There are also new settings specific to screen sharing. The host controls will appear at the bottom of your screen. Join Audio: Open the options to join the audio portion of the meeting. Invite: Invite by copying the invitation, the join link, or by phone or room system (if available for your account). Manage: View the participants list and manage the participants. Read more about managing participants. Record: Start a cloud recording. Leave Meeting: You can leave the meeting. Note that if you leave the meeting without designating another host, the meeting will end. 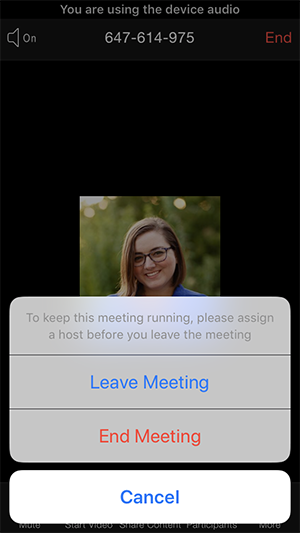 On an iPhone, the host controls will appear at the bottom of your screen, except for End Meeting. On an iPad, they will appear at the top of your screen. Share Content: Tap this to start a screen share. You will be able to select what you would like to share. Learn more about screen sharing. Participants: View the participants list and manage the participants. Read more about managing participants. More: There are additional settings available under More. Advanced Settings: Additional advanced settings are available by tapping Advanced Settings. Lock Meeting: Prevent any new participants from joining the meeting. Play Enter/Exit Chime: Choose if you would like to play a chime when new participants join. Put Attendee in Waiting Room on Entry: Have participants enter a waiting room where you can then admit them. Read more about waiting room. End: Tap End to end or leave the meeting. After tapping end, you will have the option to choose which you want to do. 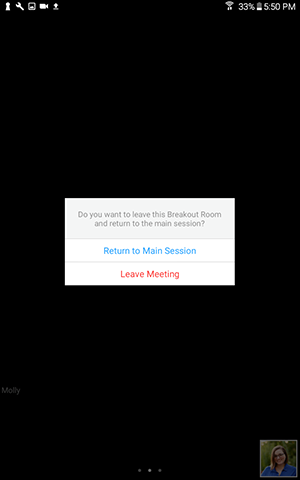 The host controls will appear at the bottom of your screen, except for End Meeting with appears at the top of your screen, next to the Meeting ID. Share: Tap this to start a screen share. You will be able to select what you would like to share. Learn more about screen sharing. Put Attendee in Waiting List: Have participants enter a waiting room where you can then admit them. Read more about waiting room. Navigate to the Local Recording option on the Recording tab and verify that the setting is enabled. The host must record the meeting or grant a participant the ability to record. Start a Zoom meeting as the host. Click the option to Record. If there is a menu prompt, select Record on this Computer. Otherwise, ignore this step. Hosts will see the following recording indicator in the top left corner when the recording has started. Participants will see the following indicator in the top left corner when the recording has been started by another user. Note: If the above recording icons are not visible in the meeting, the conference is not recording. Clicking the Participants menu will also display a recording indicator next to the user who is actively recording. Note: Dial-in participants will hear a message informing them that the meeting is now being recorded unless disabled by the Host. Wait for the recording to convert before it can be accessed. Once the conversion process is complete, the folder containing the recording files will automatically open. Note: By default, the audio/video file (MP4) will be named "Zoom_0.mp4." The audio only file (M4A) is named "audio_only.m4a." Important: If the meeting unexpectedly shuts down or if the conversion process is interrupted, the recording files could become corrupted and non-recoverable. During a Zoom recording, a user can Stop or Pause the recording. If a user stops the recording and starts it again, a new video file will be created for the next recording segment. 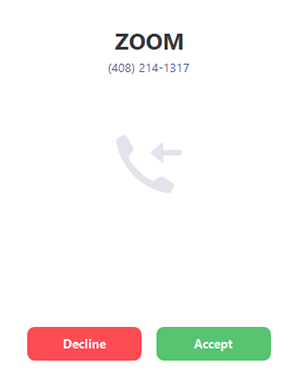 If a user pauses the recording and starts it again, Zoom will record to the same video file for the recording segment. After a recording has been started, click Pause or Stop Recording at the bottom. The recording can also be stopped or paused by clicking the indicator in the top left corner. When a recording is paused, the following indicator will be displayed in the meeting. The recording can also be resumed by clicking the indicator in the top left corner. In a Zoom Meeting click on Manage Participants. In the Participants menu navigate to the user who will be granted recording privileges. Select the option to Allow Record. When a participant is recording, the participant menu will display a red bubble next to the user's name. The host can disable the participant's ability to record by repeating Step 2 -- except the host will select Forbid Record. You can record the active speaker, content sharing with active or sub video panel, gallery view or M4A audio. 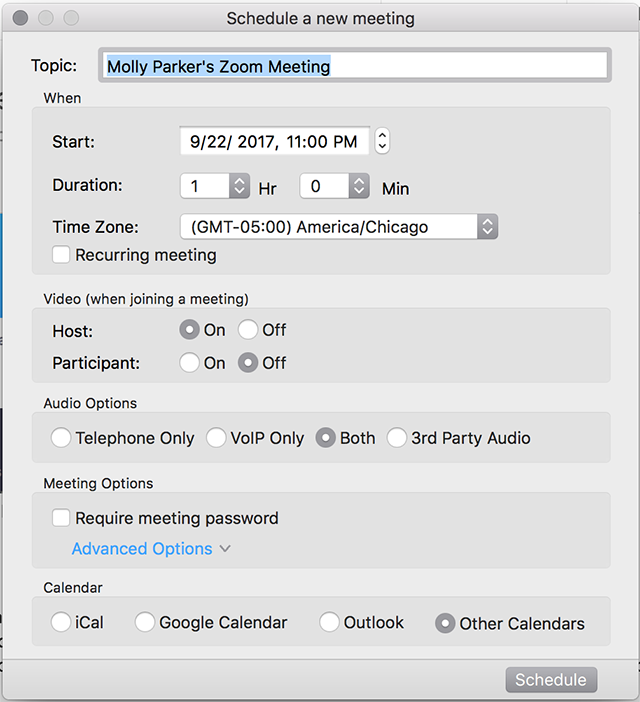 By default, only the host can record each Zoom meeting. This can be changed by having the host allow specific users to record the meeting through the Manage Participants panel. Each resulting recording will be in the layout of choice by the person who is recording. The Zoom meeting will be recorded in the current layout that the host is recording. For example, if the host is recording in Gallery View the recording will be in gallery view. This is independent of what the participants are viewing, so if I participant is watching the meeting in active speaker view and they start recording because the host granted them recording the resulting recording will be in Active Speaker. Note: If you move the active speaker display thumbnail to the edge of the screen or to additional monitor from the one you are presenting from the thumbnail will show up in the surrounding black bars on the recording. Example: Thumbnail on the main display. 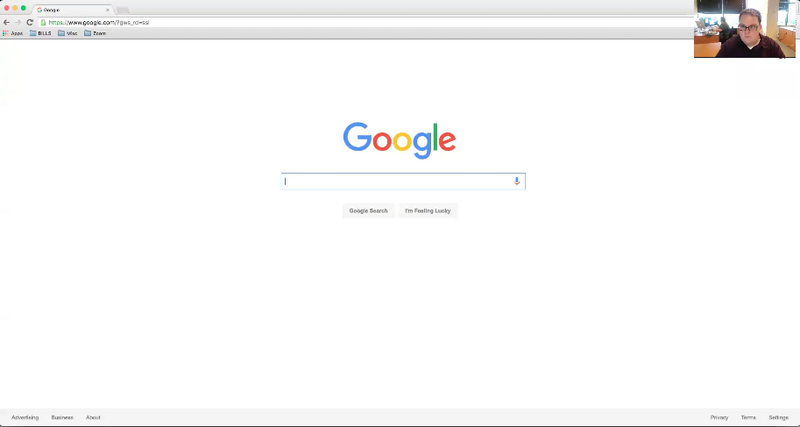 Example: Thumbnail moved to another monitor or edge of screen. 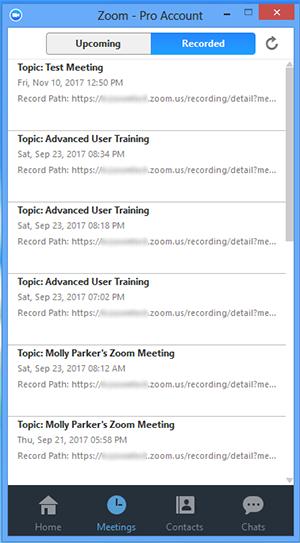 To access a recorded meeting, open the Zoom client and select Meetings. Click on the Recorded tab up top and navigate to the meeting. Play Video: Selecting "Play" from the Zoom Client will play the recorded meeting with the default media player. Play Audio: Selecting "Play Audio" from the Zoom Client will play the recorded meeting audio with the default media player. Open: Selecting "Open" will open the folder that contains the recording files. Delete: Selecting "Delete" will remove the meeting from the recording list on the Zoom Client only. Note: Deleting the recording from the Zoom Client does not delete it from the local computer or folder. Note: If there are issues opening or playing the file, check the default recording file path (Zoom folder) to ensure the files are in the correct place. Open the Zoom client and click Settings. This will open your recording options. Store my recordings at: Click on the arrows and click Choose a New Location to select a new destination for local recordings on your computer. Note: Setting the default location to a cloud syncing folder (such as Dropbox, Google Drive, or One Drive), an external drive, or network storage device may cause issues with saving and converting the local recording. 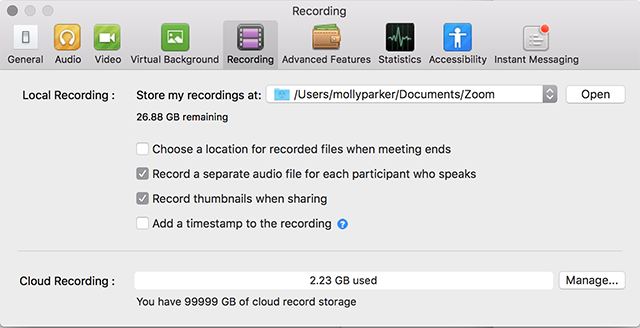 Zoom strongly recommends keeping the default location on a local drive for recordings. Choose a location for recorded files when meeting ends: Check this option to always choose where you would like local recordings to be saved to on your computer. 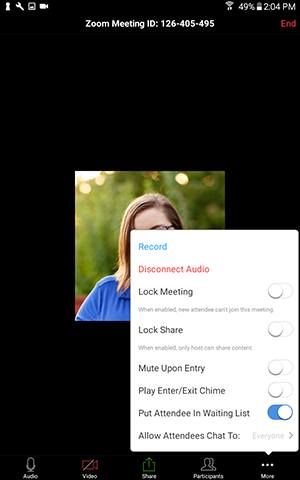 Recording a separate audio file for each participant who speaks: Check this option to generate an audio-only file for each participant who speaks during the meeting. Optimize for 3rd party video editor: Check this option to generate your local recording video files with a standard format that is compatible with 3rd party video editors. This may increase file size. 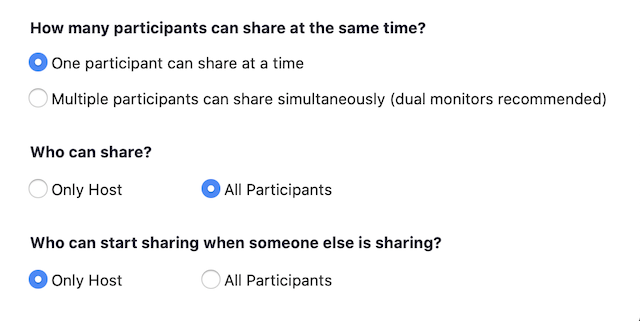 Record thumbnails when sharing: Check this option to include thumbnails of the participants' videos when screen sharing. If you are in active speaker view, it will record only the active speaker's video. If you are in gallery video, it will record multiple participants' videos. Add timestamp to the recording: Check this option to add a timestamp to the recording. It will show the time in the time zone of the computer where the meeting is being recorded. Chat: Standard text or .txt file. This is named "chat.txt" by default.